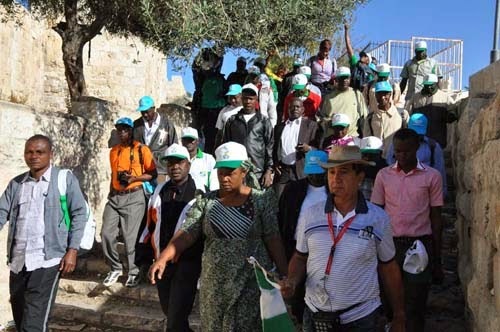 Nigerian Christian Pilgrims walking through Old City of Jerusalem , Israel yesterday. Photo by Gbemiga Olamikan. About a 100 Christian pilgrims absconded during the 2017 pilgrimage to Israel, said the Executive Secretary of the Nigerian Christian Pilgrim Commission (NCPC), Rev. Tor Uja. Uja, who made this known while receiving security report of the 2017 pilgrimage on Monday in Abuja, said that no pilgrim absconded in Rome and Greece. He said that pilgrims absconded during pilgrimage as a result of their colonial mindset. Uja said that Nigeria is a nation of future while explaining that the coming together of Nigeria was beyond what the colonialists conceived, he said it was an act of God. Uja revealed that the commission has come up with stringent measures that would discourage pilgrims from absconding, such measures as black listing states with penchant for abscondment, publishing the names of absconders and their guarantors in national newspapers, and prosecuting them eventually. Earlier, Maj-Gen Emmanuel Nega, chairman of the committee, said that security is the most important aspect of the commission. Nega said that the committee was inaugurated to ensure the security of pilgrims to the holy land. He said that the committee has documented its recommendations that would assist the commission in terms of security and to prevent pilgrims from absconding. According to him, the committee consist of 18 members made up of the Nigerian Army, Nigeria Airforce, Nigeria Police Force, Nigeria Immigration Service, Department of State and Security and Federal Airport Authority of Nigeria.